Things are getting a slow start at the MArket Garden this year. The soil is quite cool and most of the farm completely waterlogged. However, I was able to get into the potato patch the past two weekends. Below is 100#’s of potatoes – 50 each of Yukon Gold and Kennebec. The Grillo does OUTSTANDING work in this application. The Berta Rotary plow will cut a 1′ wide, 1′ deep furrow through the soil, neatly mounding everything to the right. 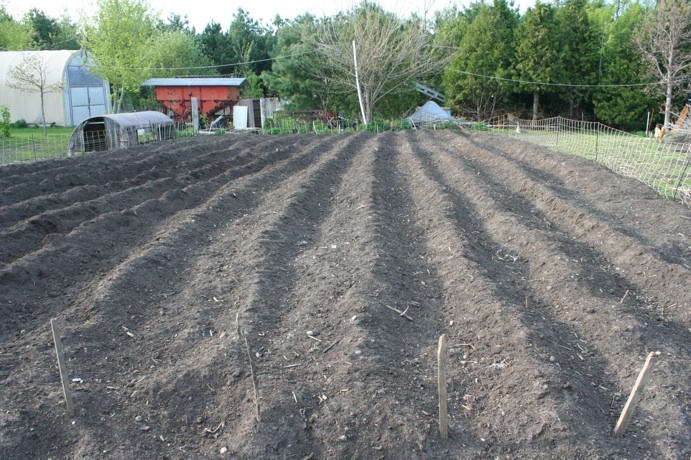 I then rake out the furrow to an even depth (not really necessary) and plant the seed spuds. Then comes my favorite part, I turn the Grillo around, putting one wheel on the mound and cut the next furrow working my way back up the plot. As I work along, the plow throws some of the soil from the new furrow up over into the seeded furrow neatly burying the seed, and leaving enough soil mounded between to “hill” the plants as they come in. The result are seen above. Working at a leisurely pace, I can see 360′ (40-50#’s) in a couple of hours including chasing chickens out of the plot and stopping to chat with the other tenants. Soil prep on this plot was done about a month ago – it was planted with a rye/vetch mix last October and very heavily grazed by 100 chickens and 2 dozen geese all winter. There was very little top growth, but decent root mass. More importantly, there was significant manure, so I tilled it in lightly with a rototiller to get the soil breaking that down. That is the only fertilizer this plot has received in 2 years. Counting that hour of tilling, I have about 5 hours of work so far in this plot. There will likely be another 5-10 in hilling and weeding, and it will take me about 10 hours total to harvest it. Worst case scenario, I about 25 hours for 800-1000#’s of potatoes, which I can sell for $2/lb. Time to market will be another 5 hours in delivery. That works out to 30 hours of labor. Seed was $200, cover crop about $10, and fuel less than $2. Net Profit will be about $1500. That works out to $50/hr. I love growing potatoes. This is fabulous! I’ll also point out that this is over 300,000 calories – critical for real life-sustaining gardening/farming. I just planted about 15 lbs of potatoes in my newly prepared garden beds. (Started last year by tilling, black plasticing the area to kill the cooch grass, then added black peat topsoil to the sandy loam this month). All the old timers around here warn against adding manure of compost to potato soil as they say it will cause scabs. Every book I have says add manure or compost to potatoes. I’ve followed the advise of the oldtimers around here since experience is the best indicator. What is your experience with this? Also, does that low fence around your field keep out the chickens? Also, I planted my seed potatoes about 8″ apart, I’m wondering if I’ve screwed that up and should have given them more room? 1) My understanding is that scab is caused more by heat or inadequate water than anything else. Not sure though – I plant in almost pure compost and had very little scab. 3) Depends on the variety – Yukon’s I put in 10-12″ as they are poor producers, Kennebec and Purple Viking I am more like 14-16″ as they throw lunkers. I had more success with slightly larger spacing last year to allow the plant canopy to really leave out in my Carolas. I also have ALOT of land. 8″ is pretty tight though. You will likely have similar yield per sq ft, but reduced yield per pound of seed. Try to hill them more to compensate by allowing the spuds to produce more vertically than horizontally. Could you please tell me about your HOA? We live in Virginia on one-acre lots. The growing season is wonderful, but the dirt is red clay that needs a lot of work. Every HOA I’ve ever lived in forbids animals — some even got their knickers in a twist over gardens. Thankfully, our current development allows for gardens. I’m still confused about the animals — our neighbors all have dogs of various sizes. I don’t know why a goat or a chicken or rabbits would be that much dirtier. Does your HOA allow for your garden? Is that greenhouse in your backyard? Oh — I see that you have a separate Market Garden, and that’s where the hoop house is located. I still am flabbergasted about HOA’s. Our HOA is pretty standard – it specifically rules out poultry, etc. but allows up to 2 dogs with no size requirements. No mention of some of the more onerous covenants like no clotheslines or gardens. I was the 4th homeowner in the subdivision and managed to become president to ensure we kept the tone light in the enforcement of the compact. Our annual veggie gardens (500 sq ft) are in the back, with perennials up front. I began to incorporate some permaculture guilds into some of the beds with peach trees, sorrel, comfrey, etc – but you would really have to be in the know to see them as anything but perennials. The problem with our HOA is that to get the poultry bylaw overruled we will need a 2/3 majority and we can’t even get 25% to show up to a meeting. If we can get them legal in the village I think I will just meet with my neighbors, get them bought in and go from there. Thanks for the input on the potatoes. I’ve been away from the computer for a few days…funny I don’t miss it when its out of my life, except for these good tidbits I can pickup. I just noticed your latest entry on mulching, got to get there are read that. Thanks for the reply on the HOA. I look forward to hearing how it progresses. I live in exurban Northern Virginia. There are subdivisions out here (multiple) on huge lots — 5 to 10 acres — and the covenants say that only *horses* are allowed. We battle deer every day in our subdivision of 1-acre lots. Deer carry E. coli and ticks. And the subdivision people encourage them — they’re cute and fluffy and somehow “natural”. (No culling is taking place — no archers are allowed in seasonally). Did I mention we’re not allowed to have deer fencing — so we have to pray that our 4′ fences work, and thus we can only have smallish gardens because (1) we can’t fence the whole yard properly and (2) growing edible food where deer graze would be impossible and probably dangerous. No chickens, rabbits, or goats are allowed. Somehow the daily 5 or 6 deer in my backyard are considered “cleaner” than a few of those smaller animals.